Before listening, I had concerns about being able to appreciate the score (or follow the story) without benefit of seeing the production. Fortunately Jeanine Tesori and Lisa Kron’s score is tuneful and the emotional underpinnings resonant. The score manages the trick of writing very specifically for the characters and situations and, in doing so, reveals themes and feelings that are universal. “Ring of Keys” marks Young Alison’s transformative experience of meeting her first “butch”, but it’s joy and wonder can be appreciated by anyone who discovers a community in which they belong after previously feeling singular and alone. The devastating “Telephone Wire“ can affect anyone who has talked in circles around a “Big Discussion” they and their parents desperately want–but are unable–to have. Vivid performances by the uniformly excellent cast elevate the strong material. Hawks Test Report Card: No weak links, and nearly all the songs are standouts. 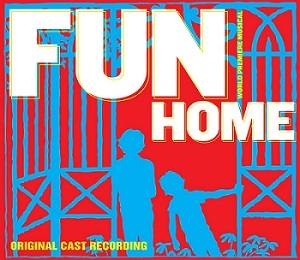 In addition to the aforementioned “Ring of Keys” and “Telephone Wire”, there’s Judy Kuhn’s great “Days and Days”, the infectious Jackson 5 pastiche “Come to the Fun Home”, the lush and joyous “Raincoat of Love”…I really might was well just post a track list.